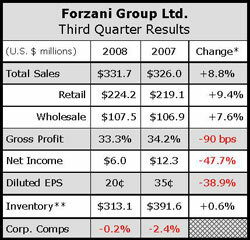 Forzani Group's third quarter results came in slightly below expectations, but the Canadian sporting goods giant noted that its stores continue to perform well against a standout year-ago performance and have shown good momentum so far in the fourth quarter. On a conference call with analysts, company CEO Bob Sartor said performance is being particularly helped by a decision to eliminate commission pay at Sport Chek, its flagship chain. Sartor also noted that the shift was made while maintaining its payroll percent to sales on an annualized basis. Sartor noted that for the first five weeks of the fourth quarter, comps nudged ahead 0.1% at its corporate stores and grew 6.2% at its franchise stores. These results were on top of comp increases in the prior year of 4.9% and 16.7%, respectively. Corporate store margins improved on both a rate and dollar basis. Excluding a tax charge related to assessments in the 2004 and 2005 tax years, third quarter earnings were down 33% to CN$8.4 million ($6.8 mm), or CN28 cents a share. Revenue rose 8.8% to CN$362.9 million ($290 mm) due to the acquisition of Athletes World and an 11.5% comp hike in franchise locations. Comps at corporate stores slipped 0.2%. Analysts were apparently expecting an average of CN36 cents a share and revenue of CN$358.8 million. Corporate store revenues climbed 9.4% to CN$245.3 million ($196.4 mm), thanks to Athletes World sales. Wholesale sales climbed 7.7% to CN$117.6 million ($94.1 mm) as a 10.3% hike in wholesale sales to its franchisees offset declines in licensing due to a challenging U.S. wholesale market. By category, footwear comped positively in the quarter despite some aggressive liquidation activity, according to Tom Quinn, company president and COO. Outerwear and athletic clothing “continues to post impressive positive comps.” In equipment, fitness, racquet sports, camping, travel, backpack and sport bag categories achieved solid positive comps. Ski and snowboard were softer as Forzani pushed advertising in these categories later in the season. Said Quinn, “Whatever comps declined in the third quarter have already been made up in the last six weeks.” Bike, team sports and hockey saw relatively flat comps. Gross margins contracted 90 basis points due to more aggressive promotions and sharper pricing “given the prevailing retail landscape,” management said. Corporate same-store operating expenses were reduced to 25.4% of sales from 26.0% a year ago due to cost controls and reduced performance-related compensation accruals.